I needed to configure some Cisco routers to send syslog messages to a syslog server; here is how I did it. 1. 192.168.5.190 is the IP address of the syslog server you are sending the messages to. 2. I was not receiving messages from the remote routers; after some troubleshooting I discovered I needed to tell the remote routers what interface to send the message out on. In my case is was BVI1. A quick way to test connectivity from the router is with the ping command specifying the source interface. 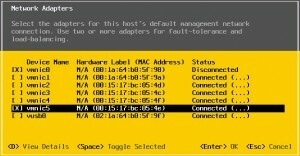 Today one job is to upgrade the IOS image on a Cisco 1801 router. To achieve this you will need the IOS image and a tftp server to load the image from. 1. Download the new image from Cisco. You will need a CCO login (get a smartnet contract to get access). 2. Check that the flash memory on the router has enough space for the new image. 3. Check your router has the required memory (check the requirement for the IOS when downloading). Cisco 1801W (MPC8500) processor (revision 0x400) with 354304K/38912K bytes of memory. 5. Tell the router what image to boot from. I was having trouble with my solar monitoring software closing down at random for no apparent reason every three to seven days, I was unable to find any pattern to this behavior. To solve the problem I scheduled this vbscript to run every hour. I did not write it from scratch, I used examples to get the result you see here. The script looks for the program by name and starts the program if it’s not running. I have changed the script to notepad.exe for testing, change it to whatever your program name is. The program I am using is SG-View.exe from solar-guppy. My solar hardware consists of 16 x 185 watt panels, a Xantrex T 2.8 inverter and an old laptop with a serial port. SG-View.exe is the program that collects the data from the inverter. The data is then uploaded to pvoutput.org. There are some lines you will want to comment out once you are sure its working, like this message box Msgbox(“Notepad is not running, I will start it now”) it is only there for testing (put a ‘ in front of the line to comment it out). Copy this code, open notepad paste it and save it as filename.vbs where filename is what ever you want to call it. 'Check if a program is running, if not run it. We have squid cache / proxy running on a number of Windows servers in diffident geographical locations with the access.log file on the local server in each location. The problem was our reporting software LightSquid was in one location and needed a single access.log file. To solve this problem I created a simple script and scheduled it to run every hour. The script collects the remote access.log files and combines them into one access.log then uploads the access.log to the Linux box running LightSquid for processing. Here are the contents of the two files cp.bat (schedule this one to run hourly) and squid.ftp, create a folder called c:\AccessLogCP and put the two files in it. I received this error when changing a TCP/IP settings on a VMware virtual machine that was converted from a physical to a virtual machine. 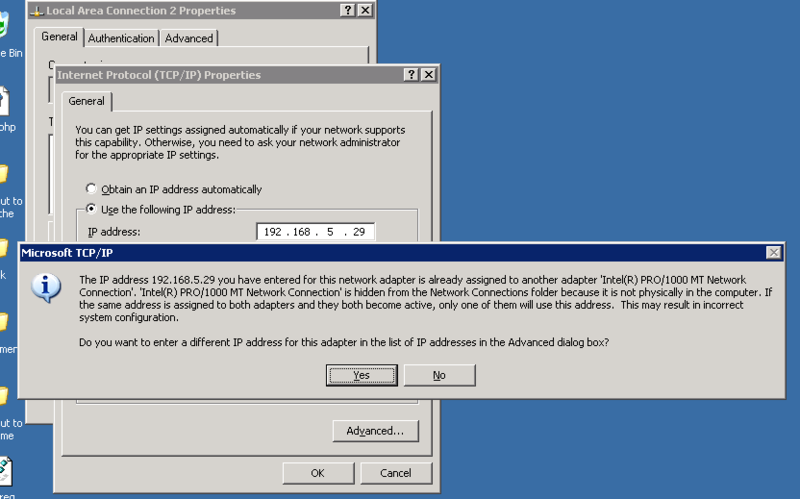 The IP address you entered for this network adapter is already assigned to another adapter. You may also get this message; Cannot rename this connection. A connection with the name you specified already exists. Specify a different name. 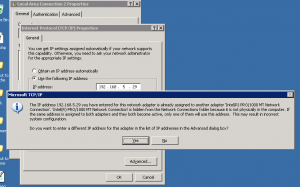 The problem is a hidden network adapter with the same connection name or TCP/IP setting. 1. Click Start, click Run, type cmd.exe, and then press ENTER. 2. Type set devmgr_show_nonpresent_devices=1, and then press ENTER. 3. Type Start DEVMGMT.MSC, and then press ENTER. 4. Click View, and then click Show Hidden Devices. 5. Expand the Network Adapters tree. 6. 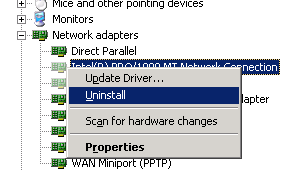 Right-click the dimmed network adapter, and then click Uninstall.